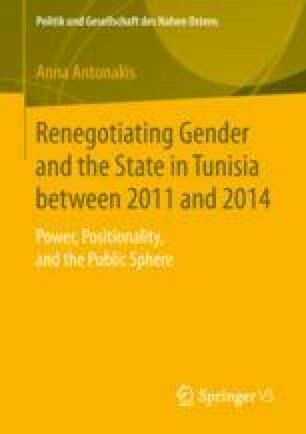 This study set out to explore multifaceted dynamics of gender relations in the post-revolutionary Tunisian public sphere. Departing from the complexities of the empirical world necessitating a multi-layered analysis, a theoretical framework was developed in chapters 3 and 4 based on the epistemological and methodological premises outlined in chapter II. This allowed very different negotiation processes to be grasped in relation to women’s positionalities and their resources.